On the third Sunday of each month, the Veterans Stadium parking lot at Long Beach City College buzzes with shoppers vendors and looking to buy and sell an incredible variety of vintage goods. The Long Beach Antique Market boasts hundreds of open-air stalls, free parking, and a few food and drink vendors on-site. Twenty acres of space and seemingly endless rows of vendors make this a great place to check off some decor needs for your home or apartment, spice up your wardrobe, or even just wander around and window-shop. Grab your sunscreen, get ready to haggle for some bargains, and check out their website to make sure you mark your calendar for the next time the Long Beach Antique Market is in town! Tons of stalls sell clothing, shoes, handbags, and other accessories. Each merchant has their own unique flare, which means there are a wide variety of styles to cater to every taste. 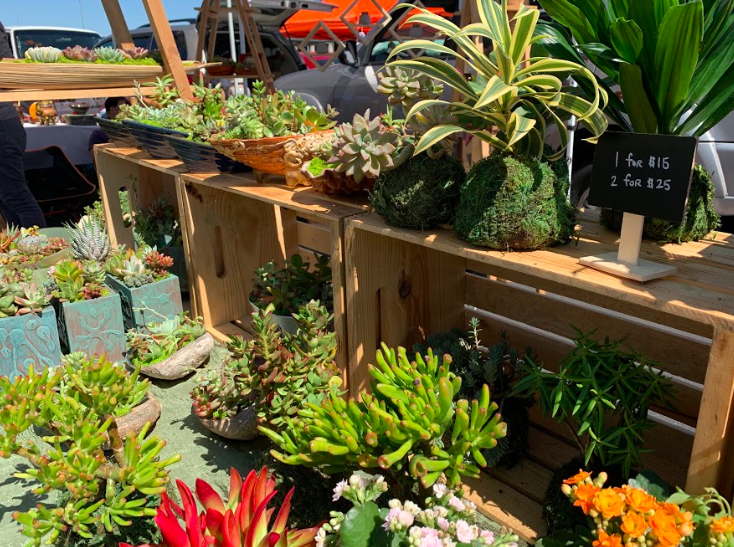 While it might not be an obvious first choice, the Long Beach Antique Market is the perfect place to stock up on trendy, secondhand pieces as the weather starts to warm up. This is one of many stalls selling furniture, decor and other pieces for your living space. Vendors selling tables and chairs of all sizes, chests of drawers, and rugs appear to be the most abundant, but there is no shortage of just about anything else you could picture in a home. Mirrors and other kinds of wall hangings were plentiful, with everything from framed art to metal signs to beautifully dyed tapestries. Moonchylde Collective is just one of the dozens of jewelry stalls to be found at the Long Beach Antique Market. The beautiful pieces pictured here are handmade by CSULB alumni Janelle Milne, who is the owner and designer at Moonchylde Collective. Some stalls feature rare vintage pieces that will cost you a pretty penny, but there are plenty of others selling fun and unique pieces at a very reasonable price! A surprising number of vendors offered a selection of houseplants, ranging from classic potted succulents to more creative arrangements like the ones shown here. Seashells, ceramic dishes, and carved wooden bowls were some of the most eye-catching planter substitutes – making for either a great purchase or some seriously original DIY inspiration.